In some weird Astral Plane, the mystical monkey-man, Pai-Doth Noor is nearing death. He has lived a long time and done many things, but fears having it come to an end. So, remembering a debt owed to him by Leonardo, he summons the Ninja Turtle. Leonardo, meanwhile, is 8 years-old and living in the sewer lair. At a ceremony, Splinter tells him that he has finally graduated from his wooden practice sword to a true blade. Childishly enthused, he plays with the sword late into the night until he vanishes at Noor’s beckoning. 8-Leo finds himself in the Astral Plane alongside three other versions of himself plucked across the timeline: a 15 year-old Leo, a 45 year-old Leo and a Leo that’s over 100 years-old. Noor tells them that they are to fulfill their debt by taking a “gift” (a crystal) to the Cynocea who lives in a castle in ancient Egypt. 8-Leo is frightened, 15-Leo thinks the adventure sounds totally rad, 45-Leo is suspicious and defiant and 100-Leo seems to be the only Turtle to recall how things played out, but is keeping tight-lipped on the subject. Noor sends the Turtles to the banks of the Nile in the dead of night, where a basket containing a baby floats gently by. 45-Leo sees a crocodile about to bite the basket and leaps in to save the baby. As the baby floats away to safety and the crocodile flees, 100-Leo reveals that they just saved Moses. Suddenly, a group of Egyptian warriors working for the Pharaoh attacks. 15-Leo defeats them all with ease, sending them into retreat. The warriors quickly return with back-up and the Turtles flee. After losing the warriors, 15-Leo calls for a time-out. He thinks the very idea of walking and talking with versions of himself is weird and doesn’t understand why his two older selves aren’t saying anything. 45-Leo tersely explains that seeing what they were and can never be again is pretty damn depressing. The Turtles eventually spot a towering castle and city behind a moat and wall on the horizon. They decides to make camp for the night and continue on in the morning. At the campfire, 15-Leo thinks life is going pretty great and wonders why 45-Leo is so surly. 45-Leo simply explains that things will be changing very soon for him. Meanwhile, 8-Leo follows 100-Leo, who has gone to mediate by himself. 8-Leo sees his older self hovering off the ground by sheer force of will and marvels at just how awesome he’s going to become in the future. The next morning, the Turtles approach the city and find the villagers outside the wall pleasant and friendly. 100-Leo explains that in these simpler times, mankind is closer to nature and thus do not fear the strange quite so much. 45-Leo shakes his head, knowing that in a few generations, White Men will come and destroy the peaceful African civilizations and enslave the gentle locals. 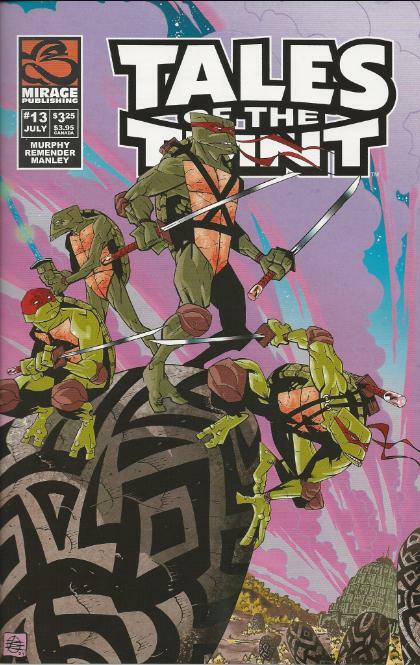 *The story concludes in Tales of the TMNT (Vol. 2) #14. *From 8 year-old Leo’s perspective, this story takes place between “The Lessons” and TMNT (Vol. 1) #9. *15-Leo exclaims that life is simple and good where he comes from, seeming to imply he was taken shortly before the events of TMNT (Vol. 1) #1 (the Turtles were 15 in that issue). *The reason 45-Leo is so cynical will be explained in Tales of the TMNT (Vol. 2) #41. *Leonardo was left owing Pai-Doth Noor a debt after the events of Tales of the TMNT (Vol. 2) #4. 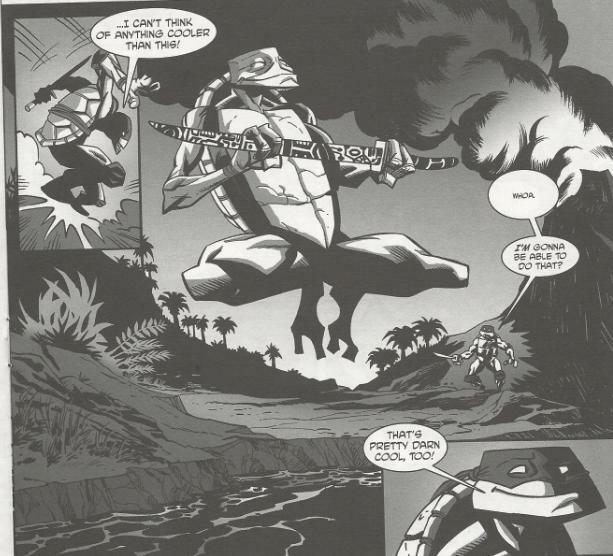 If there’s one thing I would have welcomed more of in the second volume of Tales of the TMNT, it would have been more story arcs. When the title began, two-parters came around at regular intervals, punctuating the episodic adventures that comprised the bulk of the run. “Loops”, unfortunately, would mark the end of the consecutive multi-parters and ongoing stories would be scattered amongst the episodic stories. By the late #20s, Tales would eventually eschew story arcs altogether, even in scattered episodes, and it would be a long time before we’d see any ambitious narratives again. It could be a bit frustrating, as the editorial mandate to kill all multi-part narratives resulted in entire storylines being dropped and never completed, and in my opinion, was the culprit behind a creative lull around the middle of the title (Tales Vol. 2 was strongest at its bookends, if you ask me). 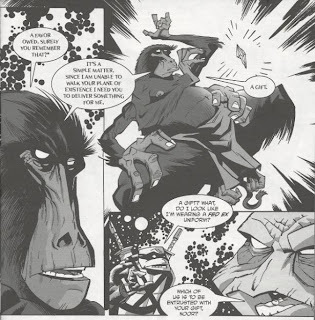 “Loops”, however, closes one of the loose threads left dangling after “Worms of Madness” concluded (the other won’t be dealt with until Tales #33) and is stronger because it takes the extra time to flesh out the potential of its concept, rather than race to cram it all into 20-something pages. 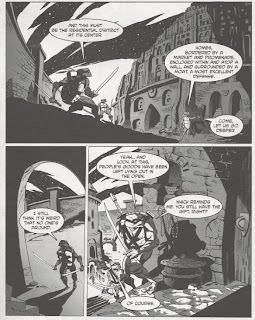 While Murphy’s various political and environmental agendas had a habit of making his work seem stuffy (he doesn’t miss an opportunity to awkwardly rant about the evils of white slave-traders in this issue), he never-the-less has one of the better understandings of the core characters in the TMNT franchise. I may be mistaken, but I’m pretty sure he is in fact the most prolific author to work on the Ninja Turtles, having written more full issues than anybody else (thanks in large part to the lengthy run of TMNT Adventures). As a result, he succeeds in making each of the four Leonardos feel distinct, but never betraying their fundamental personalities. Leonardo is often the “Cyclops” of the Ninja Turtles; the perpetually dull straight-man that is no fun to write because he can’t be as strong a subject as his more eccentric brothers. So while the idea of a story with FOUR Leonardos might sound rather loathsome on the surface, Murphy finds a natural way to make each incarnation stand out and play off one another for comedic and dramatic effect. 8-Leo is nervous and unsure of himself and just a bit childishly frightened. 15-Leo is youthful and reckless and used to a pretty sheltered, fun-loving lifestyle in the sewers (it’s clear he hasn’t battled the Shredder yet). 45-Leo is a cynical jerk, hardened and exhausted from years of struggle and loss (the fleshing out of this personality is of the better continuity nods in the otherwise irksome “Swan Song”). 100-Leo, meanwhile, is basically the “Splinter Jr.” he always wanted to be but refused to admit when his brothers teased him about it. I instinctively read him with Ed Asner’s voice and that automatically made him my favorite of the four. The actual plot at work in this issue is somewhat thin (not really going anywhere until the second half of the arc); it’s really more an excuse to watch these four incarnations play off each other in different ways. As such, this half of “Loops” is more a character spotlight on Leonardo than anything plot-driven. The bit where they save Moses was a little hokey, but the issue needed some action and Murphy could have done worse. Remender’s art is very slick; I’ve always enjoyed his take on the Turtles. At times he makes some gaffs, forgetting 8-Leo is supposed to be wearing a skull-cap bandana and sometimes drawing 45-Leo with 15-Leo’s sword sheath set-up (45-Leo is supposed to have them arranged in an X while 15-Leo is supposed to have them both at his right shoulder). Toner Mike Manley doesn’t help, as many of the bandana and identity mistakes come from him (shading the tops of heads like 8-Leo’s skull-cap bandana, or shading the top of his skull-cap bandana like his head). Regardless of these nitpicks, it’s still a very good-looking issue and Remender’s skill at action layouts really speaks for itself. I’d say that “Loops” is probably less exciting than “Worms of Madness”, but it still qualifies as a good story. There are very few truly memorable Leonardo-centric tales out there, so I welcome any issues that manage to weave an entertaining adventure around such a dull character.